In what is perhaps the least surprising story of the last 40+ years has gotten a bit of traction. Apparently, people object to being thrown on the social scrap heap so much that after awhile, they just give up and do things that lead to their premature deaths. Meanwhile the economics profession actually has the temerity to congratulate themselves on successfully managing the economy and churn out reams of phony, misleading, and ultimately irrelevant statistics to support their claims. That's pretty much their job, after all�to keep the unhappy peasants from hanging the financial classes from the lampposts. As for me, I always revert to the Institutionalist response to terminal hopelessness�PUT THESE PEOPLE TO WORK at decent jobs that have meaning and purpose. You know, like rebuilding the infrastructure to meet the specifications of a fire-free future. I also believe in the Instinct of Workmanship as described by Veblen and am still swayed by my Lutheran upbringing that taught work was a form of devotion. Regular readers cannot be surprised by any of this. 'Deaths of Despair' are more than a sign of neoliberal incompetence, it demonstrates these fools are also heartless and cold-blooded killers. The ONLY way they can possibly sleep is to comfort themselves with the rationalization that the dying are mostly victims of their failure to 'learn' the principles and 'virtues' of Leisure Class uselessness. 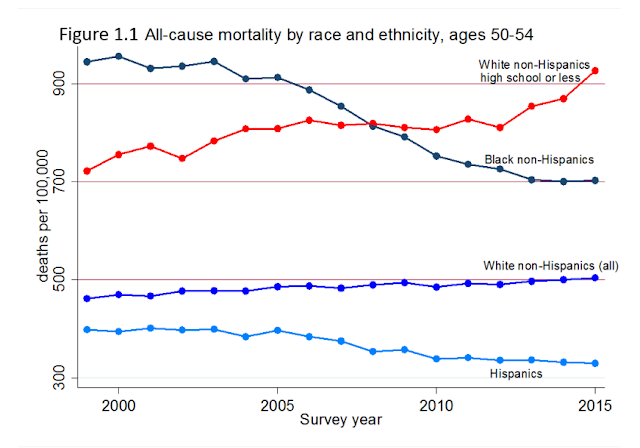 "Deaths of despair" � deaths related to suicide, drugs, and alcohol � continue to increase among middle-aged white working-class Americans without a high-school degree, according to research by Princeton economists Anne Case and Angus Deaton. Their deaths are now outpacing those of minorities of the same class by a stunning margin. Titled "Mortality and Morbidity in the 21st Century" and published by the Brookings Institution on Thursday, the findings are an update of Case and Deaton's 2015 work on death and illness among different demographic groups. Based on Case and Deaton's work, we know that what started as a scourge in the Southwest in the early 2000s has spread to communities across the country. Geography isn't a dominant factor � this isn't a rural or urban problem exclusively. Instead, the problem is a class thing. It's an identity thing. And this isn't the first time that social change has caused self-destructiveness on a mass scale. Indeed, 19th-century French sociologist Emile Durkheim wrote about similar problems in his time, and might refer to the plague of white middle-class mortality we see today as "a state of upheaval." Of course, the lesson of the 2016 presidential election was that working- and middle-class whites are suffering. What Durkheim offers, though, is the argument for why the newly elected government in Washington � voted in by this very constituency � is getting the solution all wrong. The way to fix this problem is not through less government � but through more. Durkheim's seminal work, the 1897 book "Suicide," remains one of the most in-depth examinations of why these situations occur in society, and it is as relevant as ever. Its lessons are an indication that as a country, we are moving swiftly, carelessly in the wrong direction. The Americans we are talking about are white and middle class. They are aged 45-55. They are losing the battle against heart disease and cancer, and they are succumbing to drugs, alcohol and suicide at rates unseen in modern history or in other developed countries. 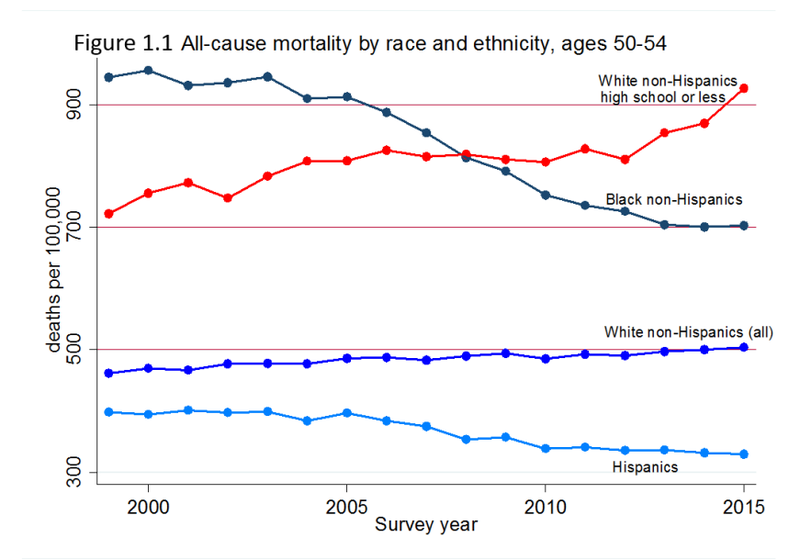 "The combined effect means that mortality rates of whites with no more than a high school degree, which were around 30 percent lower than mortality rates of blacks in 1999, grew to be 30 percent higher than blacks by 2015," Case and Deaton wrote. The easy thing to say is that these people are suffering from economic and social anxiety and leave it at that. What's harder to pinpoint is what exactly that means and how to fix it. Economic conditions for minorities in the same social class and in the same communities are as hard, if not harder, than they are for middle class whites. But death rates aren't increasing for them. This is where Durkheim comes in. He wrote his work in the midst of another state of upheaval, as industrialization was taking over the world and old economic patterns were falling away. This was the beginning of modern life as we now know it. And it was killing people. Durkheim found that the degree to which a person is integrated in society is inversely correlated to their likelihood to engage in life-threatening behaviors and suicide. In his work, he identified three kids of suicide: altruistic, anomic, and egoistic. Of the three, the most complicated is anomic suicide. Anomie essentially means the breakdown of social values and norms, and Durkheim closely associated anomic suicide with economic catastrophe. Case and Deaton associate trends in modern American mortality with the "measurable deterioration in economic and social wellbeing" of white middle-class workers as manufacturing jobs have disappeared from the workforce since the 1970s. One of the big factors, then, in the increase in substance abuse and suicide among the white middle class could be a decline in the social framework as a result of the rapid economic changes seen over the last few decades. It is not a surprise, then, that Donald Trump won the presidency on promising to bring these jobs back. The appeal of a high-paying honest job that commands respect from one's peers is strong. As Durkheim wrote: The workman is not in harmony with his social position if he his not convinced that he has his deserts." That last word, deserts, is important. Anomic suicide is associated with one's expectations for oneself in modern society. This could explain why white middle-class Americans are taking the decline in their economic fortunes harder than their minority cohorts: In the old economic order, it was more or less understood that members of the white working class could, through hard work, attain a good life with a stable, high-paying job. You know, the American Dream. It's obvious that white middle-class Americans have had their dream shattered. All the while, the market, and the rest of the country, has moved on with the normal "feverish impatience of men's lives," as Durkheim wrote. The other of Durkheim's three forms of suicide, egoistic suicide comes from a state of heightened individualism in which a person is untethered from society. This can happen at times of person or collective stress. It is an evaporation of feelings of community support or common identity. It is an intense feeling of loneliness. It might occur when someone loses their job, abandons their church, their institutions, their family � things that make them feel like a part of something larger. These are all characteristics of (but certainly not limited to) individuals going through economic hardship, and so along with the broader breakdown of society we considered above, self-destructive behavior and suicide could be driven by more personal catastrophes resulting from the changes of our era. "Excessive individualism not only results in favoring the action of suicidogenic causes, but it itself is such a cause. It not only frees man's inclination to do away with himself from a protective obstacle but creates this inclination out of whole cloth and thus gives birth to a special suicide that bears its mark," he wrote. Fortunately, it's possible for a broader functional community to circumvent this disastrous form of suicide. This feeling of loneliness is a cruel end that government, a pillar of American identity, can step in and help prevent when individuals are hurting. And it should, because when individuals are hurting they're destructive to themselves and their communities. This is what government is for, in large part, protecting the collective from the violence (physical or social) perpetrated by some individuals. But what our current government is offering is the opposite. Donald Trump ran on leaving entitlements like Social Security, Medicare, and Medicaid alone, but that's not happening, as can be seen in cuts to the latter program in the Republicans' proposal to repeal and replace Obamacare. Poll after poll showed that Trump voters wanted more investment in education, but that's not happening either. They want their communities built up, but instead they're having their resources taken away � they're being broken apart. Listen to Mick Mulvaney, Trump's budget director, talk about school lunches not having any impact on performance, and you might forget that a school is not just a school � it's a community. Listen to House Speaker Paul Ryan talk about Medicaid, and you may forget that its expansion is helping to fight the opioid epidemic ravaging the very communities we're discussing. This is nothing but cruelty. Durkheim did some work on that kind of callousness among the rich and powerful too. We are a wealthy country � the wealthiest, actually � and that wealth can lead to folly. He wrote, "Wealth ... by the power it bestows deceives us into believing that we depend on ourselves only. Reducing the resistance we encounter from objects, it suggests the possibility of unlimited success against them." But success is never unlimited. The reality of life in America is that objects � in the form of social structures or physical disabilities � can defeat human beings. Based on the way we talk about government we've clearly forgotten that. The people of Durkheim's time did too. Modern political structures, he wrote in "Suicide,' all work to "reduce government to the role of a more or less passive intermediary among the various social functions." That role fails to acknowledge that objects � in this case the invisible forces of economic change and class structure � are in front of all of us, some of us more and some of us less. We are not born onto a level playing field of equal opportunity, and that field will not simply appear because we're American. We have to invest in it. Opening up avenues of opportunity takes a powerful, concerted effort from the government, and when we fail to see that, we allow people in our society to be defeated. Trump, Ryan, and their ilk might tell you that the market can offer those opportunities naturally, but the market has never pretended to care for any of us, and the idea that a person can face it alone is beyond laughable. You see, we're playing ourselves. We are living in a delusion of our own power, and in the process � by undermining the utility of government for public good � casting aside the power of the collective. We are untethering ourselves from the very things that bind us together as a society.